I had a great Friday. I spent the day with my friend, T from An Altered Addiction and T's Crafty Ways. I always get a little nervous at her house. I'm afraid if I stay still too long, she might try to alter me! 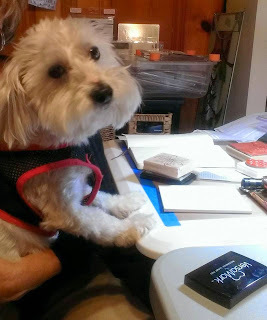 She has threatened to paint Scooter, my beautiful white dog, purple a few times. T recently purchased some of Dyan Reaverley's Dylusion Paints. Let me say, that paint is BEAUTIFUL. It is so vibrant. It covers really, really well. She lured me to come play at her studio with that paint. 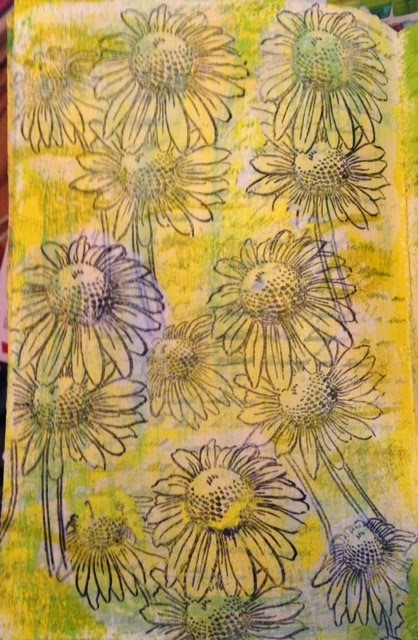 I used the yellow and the lime green on this page. After I painted one page with yellow and the other with green I added of bit of each color to the other page to mix them a bit. I used a script stamp that T had on the background to give some texture. The flowers by Stampendous were a gift from my friend, Ann. 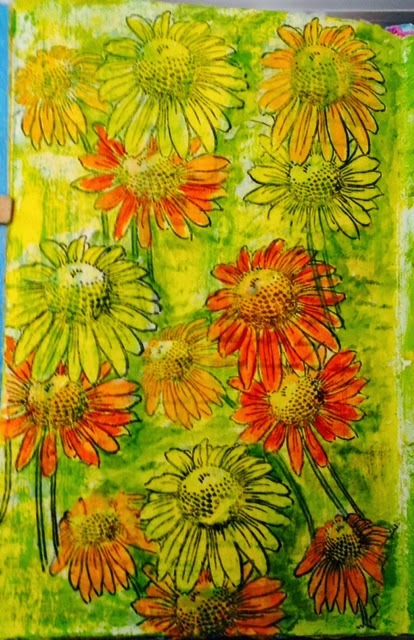 I stamped them on tissue paper with Stazon ink and then used matte medium to glue them to the page. I love my Inktense Blocks. I used them to paint the flowers. It is so easy to do with a water brush and those wonderful blocks of color. They work so well on top of matte medium. I'm thinking to The Mixed Media Monthly Challenge. Their theme this month is Flowers! That is right up my alley. Be sure to check them out. Thanks for visiting. I appreciate your visits and comments so very much. Link to: An Altered Addiction, Paint Party Friday, The Mixed Media Monthly Challenge. Scooter would be adorable purple, but I love him white too...looks like the little dogs I had for years.. Love the painting so much... it just pops off the page. I had the inktence blocks in my amazon cart and opted out... You are making me rethink that!! Beautiful work! Love the intensity of the colors of your flowers. I have been contemplating purchasing the Inktense Blocks but the cost has put me off. Gorgeous page! Love the vibrant colors. Thanks so much for joining us at The Mixed Media Monthly Challenge. Love your art journal page. I have Dyan's paints but haven't tried them yet. These colors are so pretty! Thanks for joining us in this month's Mixed Media Monthly Challenge.